Dr. Saarinen received her Ph.D. in Entomology from the University of Florida. She has also completed two postdoctoral appointments; one evaluating the population genetics of Gulf of Mexico sturgeon and the other with the U.S. EPA on predicting the risk of near shore marine species to extinction due to climate change. Her primary research interests are on animal populations that are small or declining and she focuses on butterflies, many of which are state or federally-endangered. Dr. Saarinen uses a combination of field and laboratory based methods to evaluate the current status of small populations and couples this with museum-based research to evaluate historical population trends. In her molecular lab, she uses techniques to evaluate small tissue samples of butterflies to determine remaining levels of genetic diversity, gene flow, and inbreeding. Genomic scans from next-generation sequencing has recently been useful at identifying novel molecular markers for her work. She has received multiple grants from the United States Fish & Wildlife Service and other state and federal agencies to support this research. She works with her students to evaluate and summarize all relevant data and communicate findings to assist with species management plans. Dr. Saarinen teaches a variety of lecture and laboratory courses including Ecology, Conservation Biology, Entomology, Principles of Ecological Management, and Introduction to Environmental Studies. 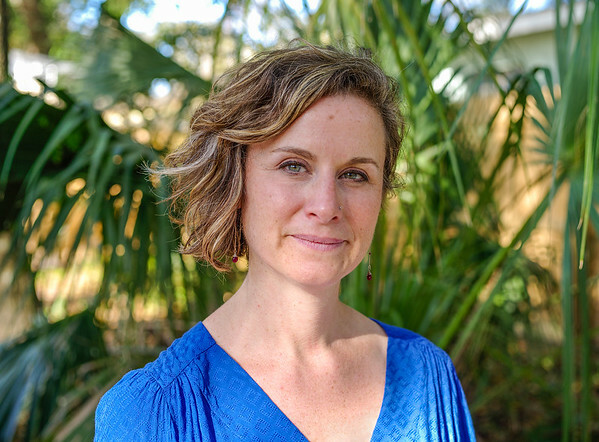 Dr. Saarinen regularly supports Pollination Ecology tutorials and clubs in addition to her work with the Sarasota Honey Company and our campus bee hives (on the Caples campus). Dr. Saarinen stresses the importance of quantitative data analysis, critical thinking, and working successfully in a group in all her courses. Saarinen, E.V, P. Reilly, and J. Austin. 2016. Conservation genetics of an endangered grassland butterfly (Oarisma poweshiek) reveals historically high gene flow despite recent and rapid range loss. Insect Conservation and Diversity 9 (6):517-528. Saarinen, E. 2015. Butterfly conservation genetics. Butterfly Conservation in North America: Efforts to Help Save Our Charismatic Microfauna. (ed. by Daniels, J.C.), pp. 75-101. Springer, UK. Saarinen, E.V., J. Daniels, and J. Maruniak. 2014. Local extinction event despite high levels of gene flow and genetic diversity in the federally-endangered Miami blue butterfly. Conservation Genetics 15:811-821. Austin, J.D., E.V. Saarinen, A.A. Perez, B. McCleery, R.H. Lyons. 2014. Twenty-one novel microsatellite loci for the Endangered Florida salt marsh vole (Microtus pennsylvanicus dukecampbelli). Conservation Genetics Resources 6:637-639. Lee II, H, D.A Reusser, K.M. Marko, C.L. Folger, R. Graham, R. Loiselle, E.V.Saarinen, M.R. Frazier, and P.J. Clinton. 2013. Crabs in Crisis and Stressed Sebastes: Framework for Assessing the Vulnerability of Nearshore Species and Habitats to Climate Change. U.S. EPA, Office of Research and Development, National Health and Environmental Effects Laboratory, Western Ecology Division. Hargrove, J, E.V. Saarinen, F. Chapman, and J.D. Austin. 2013. Microsatellite variation reveals incomplete diploidization in Gulf of Mexico sturgeon. Florida Scientist 76:409-416. Saarinen, E.V. and J.C. Daniels. 2012. Using museum specimens to assess historical distribution and genetic diversity in an endangered butterfly. Animal Biology62(3): 337-350. Saarinen, E.V., J.H. Flowers, W.E. Pine III, F. Parauka, J.D. Austin. 2011. Molecular kin estimation from eggs in threatened Gulf of Mexico sturgeon. Journal of Applied Ichthyology 27:492-495. Hargrove, J, E.V. Saarinen, F. Chapman, and J. Austin. 2011. Isolation of 15 microsatellite loci specific to Gulf of Mexico sturgeon (Acipenser oxyrinchus desotoi). Molecular Ecology Resources 11:757-758. Lee, H., D. Reusser, K. Marko, C. Emch‐Wei, E. Saarinen, T. Larsen, M. Payne, D.
Wilson. 2010. Atlas of Nonindigenous Marine and Estuarine Species in the North Pacific. U.S. EPA, Office of Research and Development, National Health and Environmental Effects Laboratory, Western Ecology Division. 1512pp. Saarinen, E.V. and J.D. Austin. 2010.When technology meets conservation: increased microsatellite marker production using 454 genome sequencing on the endangered Okaloosa darter (Etheostoma okaloosae). Journal of Heredity 101:784-788. Saarinen, E.V., J. Austin, J. Daniels. 2010. Genetic estimates of contemporary effective population sizein an endangered butterfly indicate a possible role for genetic compensation. Evolutionary Applications 3:28-39. Saarinen, E.V., J. Maruniak, J. Daniels. 2009. Development and characterization of polymorphic microsatellite loci in the endangered Miami blue butterfly Cyclargus thomasi bethunebakeri (Lepidoptera: Lycaenidae). Molecular Ecology Resources 9, 242-244. Daniels J.C., E.V. Saarinen, and T.C. Emmel. 2008. Molecular diversity of the state-endangered Miami blue butterfly. Final Report to the Florida Fish and Wildlife Conservation Commission. Saarinen, E.V. and J.C. Daniels. 2006. Miami blue butterfly larvae and ants: new information on the symbionts of an endangered taxon. Florida Entomologist 89, 69-74. Saarinen, E.V. 2006. Differences in worker caste behavior of Oecophylla smaragdina (Hymenoptera: Formicidae) in response to larvae of Anthene emolus (Lepidoptera: Lycaenidae). Biological Journal of the Linnean Society 88, 391-395. Saarinen E.V. 2005. Life history and myrmecophily of Neomyrina nivea periculosa (Lycaenidae: Theclinae). Journal of the Lepidopterists’ Society 59, 112-115. Daniels J.C., E.V. Saarinen, J.A. Pence. 2004. Disney Butterfly Biodiversity Census Guidelines. Disney Biodiversity Training Project, Disney’s Animal Kingdom, 11pp.